OLA Executive Director Minerva Perez at Tuesday’s forum. In the wake of new information Tuesday on the Trump administration’s expected immigration policies, about 500 people showed up for a forum in Bridgehampton Tuesday night to prepare immigrants and their families for the future. 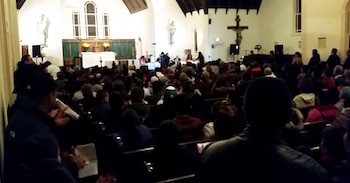 Attorneys and immigrant advocates advised attendees to avoid interactions with the police and prepare their American-born children for possible separation during more than two hours of conversation at the forum, organized by Organización Latino-Americana of Eastern Long Island at the Queen of the Most Holy Rosary R.C. Church. They also advised attendees of their constitutional rights, particularly Fourth Amendment rights against unreasonable searches and seizures, which apply to all people residing in the United States, regardless of their immigration status. The crowd filled the church. The audience was comprised mostly of people who self-identified as primarily Spanish-speaking, with a smattering of attendees who spoke only English, most of whom stood up when OLA Executive Director Minerva Perez asked American citizens who wanted to help immigrants to identify themselves. East Quogue-based immigration attorney Christopher Worth told attendees that there is good reason for the fear he’s witnessed among his Latino clients. “As of today, anybody with any kind of criminal record may be a priority for deportation,” he said, adding that people who live with people who have been previously deported or have a criminal record are also in danger of being detained by U.S. Immigration and Customs Enforcement (ICE). José Perez, who serves as the Deputy General Counsel for Latino Justice (formerly the Puerto Rican Legal Defense Fund) explained that many ICE warrants are administrative warrants, which only permit consensual entry into immigrants’ homes, as opposed to judicial warrants, which are signed by a judge. He said that immigrants have a right to remain silent, deny entry and ask to speak to an attorney if an ICE agent knocks on their door with just an administrative warrant in their hand. He also advised immigrants to not let their children open the door when someone is knocking, since ICE agents, who are often armed, regularly receive consent to enter from children who don’t know how to handle the situation. Minerva Perez, of OLA, said she was heartened by East Hampton Town Supervisor Larry Cantwell’s assertion last week that East Hampton Police won’t participate in Mr. Trump’s executive order (287-G) allowing local law enforcement to act as immigration agents. But she says this is only the beginning of the conversation with local governments. Ms. Perez urged everyone who felt safe enough to come to Southampton’s town board meeting next Tuesday, Feb. 28 at 6 p.m. to air their concerns about immigrants’ rights. Cheryl Keshner, a community advocate and paralegal with Empire Justice Center, urged immigrants in attendance, especially those with children, to make a plan for what will happen if they have contact with immigration authorities. She urged attendees to work with a lawyer to draft agreements for who will take care of their American-born children if they are deported, providing potential caretakers with powers-of-attorney to allow them to make medical and legal decisions for their children, and to make their children’s medical needs known to their potential caretakers. She also advised attendees to memorize the ID numbers on their documents, and, if they have them, to keep their current United States Citizenship and Immigration Services identification with them, and to give copies of their keys to someone they trust. Mr. Worth said it is very important that legal documents be drafted by an actual attorney, not someone who claims to be a notario, which is a title for someone who can prepare legal documents in many Latin American countries that has no U.S. equivalent. “There are a lot of crooks trying to take advantage of the community,” agreed Ms. Keshner. Francis Madi of the New York Immigration Coalition said that increased immigration enforcement priorities announced Tuesday, including a dramatic increase in the number of enforcement officers, relies heavily on funding whose source is not yet known. Ms. Madi said that, while the U.S. Department of Homeland Security announced Tuesday that Deferred Action for Childhood Arrivals (DACA), the program that allows undocumented immigrants who arrived in the U.S. as children to attend college and receive work permits, will not be changed, immigrant advocates are advising young people who have not yet applied for the program to not apply now until there is more clarity on how immigration enforcement will evolve. Young immigrants who enter the program give their addresses and personal information to the Department of Homeland Security, which could create trouble for them in the future if the guidelines on DACA change. She urged students who are currently in the DACA program to renew their enrollment “as soon as possible” if they are due for renewal. She added that, for people looking to update their USCIS identification, that agency is renewing documents more quickly than usual. She added that her organization is involved in a court accompaniment project, in which volunteers, in many cases clergy members, accompany undocumented immigrants to court to show their support and serve as witnesses. She urged U.S. citizens in the room to volunteer for that program by calling 516.387.2043. The panel also sifted through a pile of questions, written on index cards, from the audience. Panel members took several questions on whether people who have Temporary Protected Status, due to armed conflicts or environmental disasters in their native countries, can travel now. Panel members added that there was a recent case in which an undocumented woman in Texas who was the victim of domestic violence is now in ICE detention awaiting deportation after reporting the domestic violence to the police. While they haven’t heard of any such cases on Long Island, Ms. Perez advised attendees who have been victims of crimes to discuss what happened to them with immigrant advocacy groups before going to the police. Walter Barrientos, an organizer with Make the Road New York, repeatedly urged attendees to not drink and drive and to call a taxi if they had too much to drink and were away from home. He said that alcoholism is a problem for many immigrants, especially if they feel isolated and separated from their families oversees. He urged immigrants to not open the door or let their kids open the door to their house for strangers. He added that ICE agents also need a warrant to search places of business. Ms. Keshner responded to several questions about how to discuss these issues with your children. She added that, if kids are suffering from anxiety attacks, it’s a good idea to take them to see a doctor to document medical evidence that could be used in court when a judge is deciding whether to separate families. One questioner didn’t actually have a question. She had been arrested and detained by ICE several years ago and had words of encouragement for the crowd. Ms. Perez said she and the panel members plan to answer questions that could not be answered during the forum due to time constraints and share those answers on OLA’s Facebook page. OLA is also hosting a Pachanga por Paz y Unidad (A Party for Peace and Unity) to raise money for their work, featuring 28 local bands, on March 11 at Bay Street Theatre in Sag Harbor. Tickets are $20 and are available online here.